The tour included Winnipeg, Calgary, Edmonton, Vancouver, Regina and Saskatoon, updatin more than 1,100 travel agents on what’s new in the region in a bid to strengthen sales for the 2015 summer season. The Riviera Nayarit and Puerto Vallarta participated in the Sunwing Vacations’ weeklong Canada Tour, visiting the top markets in the western portion of the country. Wholesaler Sunwing Vacations has two destinations that sell very well in the Riviera Nayarit and Puerto Vallarta, which is why they asked the Promotions departments of the Riviera Nayarit Convention and Visitors Bureau (CVB) and the Puerto Vallarta Tourism Trust (Fidetur) to participate in the events. 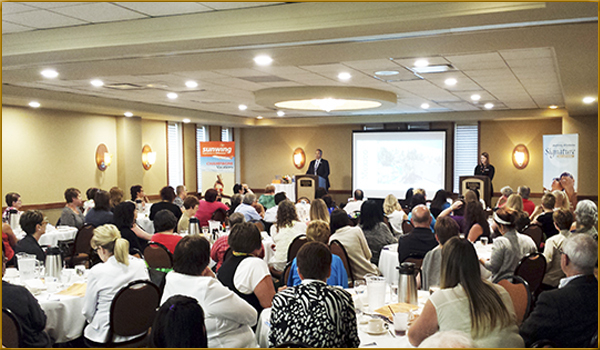 After all was said and done, over 1,100 travel agents were updated during the tradeshows. The objective was to lay the groundwork in this region of North America where the wholesaler will be operating flights during the summer of 2015. The tour began on May 19th and ended on the 28th of the month, with stops in Winnipeg, Calgary, Edmonton, Vancouver, Regina and Saskatoon. The Riviera Nayarit CVB’s official survey indicates that in 2014, 21% of the total of Canadians visiting the destination were from Alberta, 13% from Saskatchewan and 6% were from Manitoba. The six cities visited by the tour are located within these three provinces. The majority of the increase in tourist visitors from Canada to our region has happened during the winter season, so it’s important to reinforce the promotion of the destinations now in order to increase the summer numbers as well.